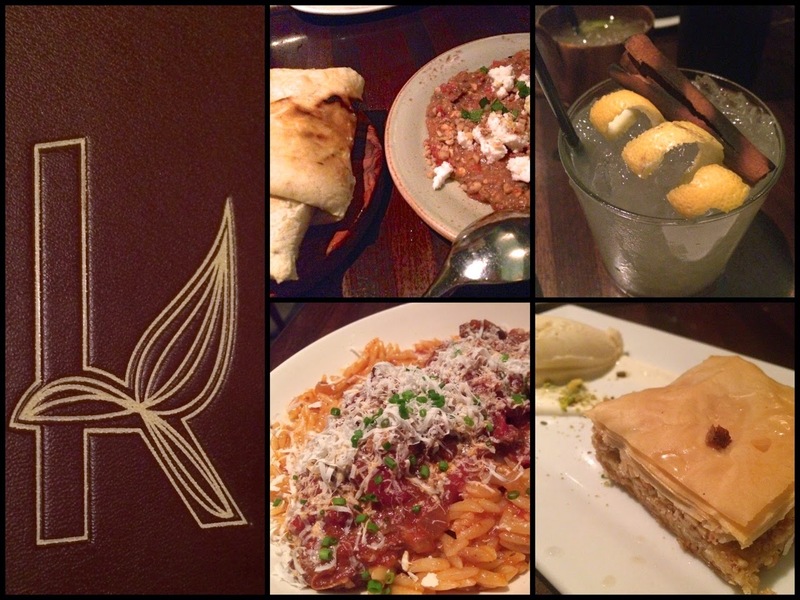 I love Greek cuisine, and there isn't a lot of it to be found in D.C. I was saddened by the loss of Yanni's Greek Taverna in Cleveland Park a few years ago, a place that Chris and I frequented for lunch on weekends. 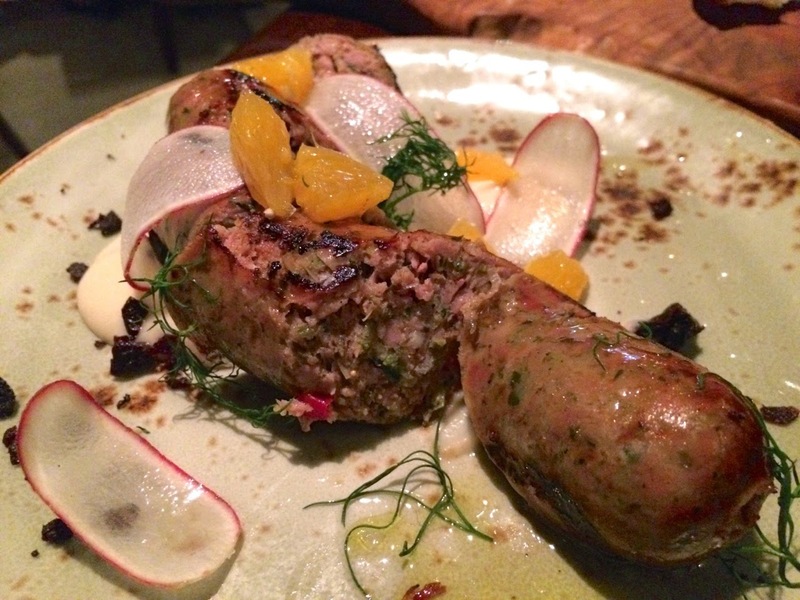 So I was pleased with last year's opening of Kapnos, the latest in the expanding local portfolio from chef Mike Isabella. While Isabella may be best-known outside of D.C. for his appearances on Top Chef, around here he's the guy behind the wonderful downtown Italian restaurant Graffiato, which wows us each summer with sweet corn agnolotti and year-round with pepperoni sauce (itself a dish made famous on Top Chef), among other delights. With Kapnos, Isabella steers close to the cuisine he first became known for in D.C. while working as executive chef at Zaytinya, the José Andrés outpost serving small-plate Mediterranean fare. While some dishes, like the wonderful spreads, may bring Zaytinya to mind, Kapnos' Greek-inspired fare charts its own creative course. Kapnos, or closely καπνό, means "smoke" in Greek, and many dishes incorporate smoke or char, bringing to mind the smoke-kissed cooking at Del Campo. Take the dolmades, for example. 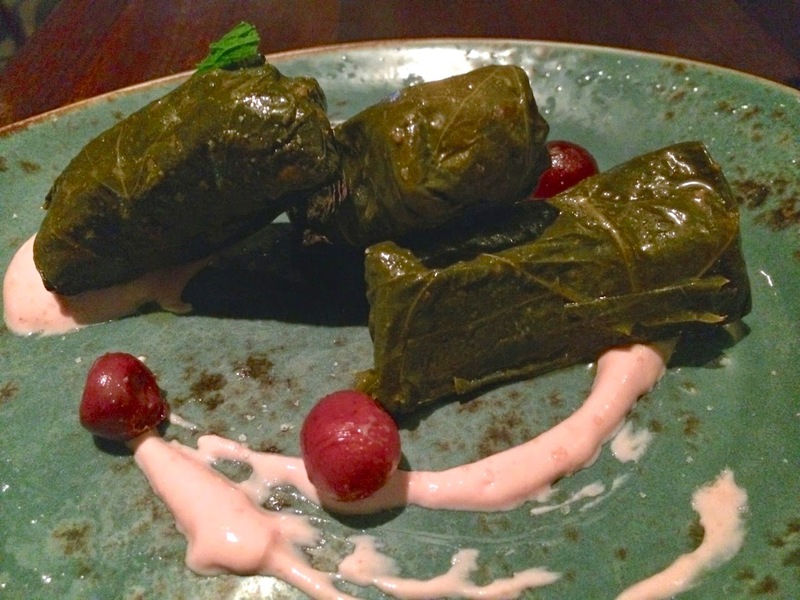 The favorite treat of grape leaves stuffed with grains and nuts is nicely done with traditional flavors but comes with a surprising side of smoked grapes. Other surprising flavors appear during our dinner, even in our cocktails. 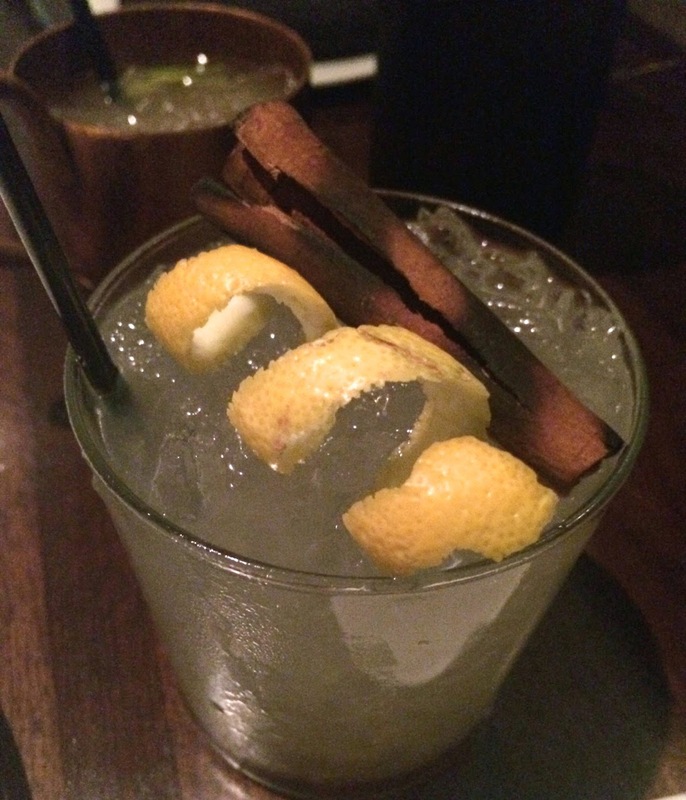 The Blame It on The Rain (I suppose named after Milli Vanilli's biggest hit) melds vodka, ginger liqueur, lemon, grilled fresno chili pepper and burnt cinnamon--making the drink "spicy" in three different, complementary ways. We preferred it to the Mustachio, a mix of pisco porton, maraschino liqueur, ginger beer an bitters that isn't bad but wasn't as memorable as the super-chilled metal cup it was served in. One of the many spreads with freshly grilled flatbread is a great way to start. If you order the smoked eggplant spread expecting to receive something akin to gaga ghanoush, you'll be surprised, as the Melitzanosalata is a totally different game, featuring roasted peppers, walnuts and feta. The spread is really good, but the flatbread is wonderful: nicely charred on the edges, warm and chewy. We ordered an extra piece just to have some to wipe up the sauces from our plates. 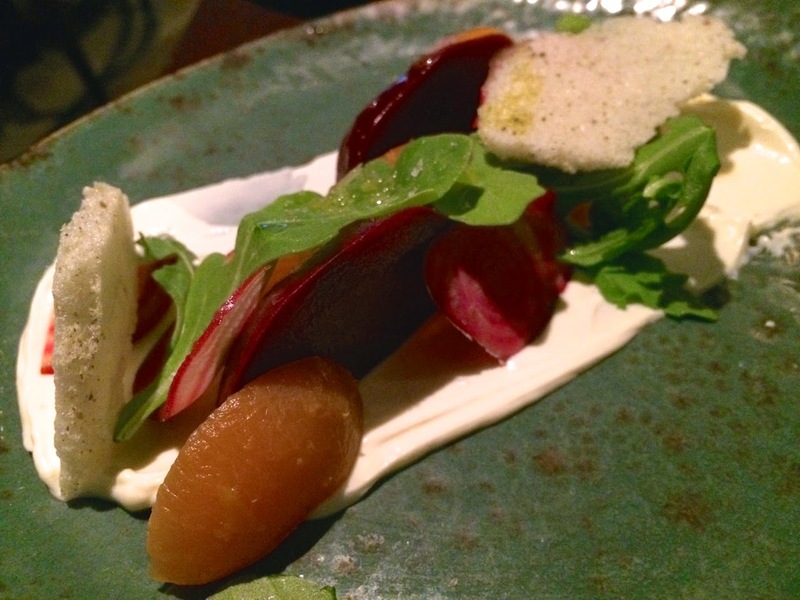 Shortly after the spread and dolmades arrived, we received a delicious smoked beet salad with yogurt and citrus, a nice balance of earthy, sour and smoky flavors. 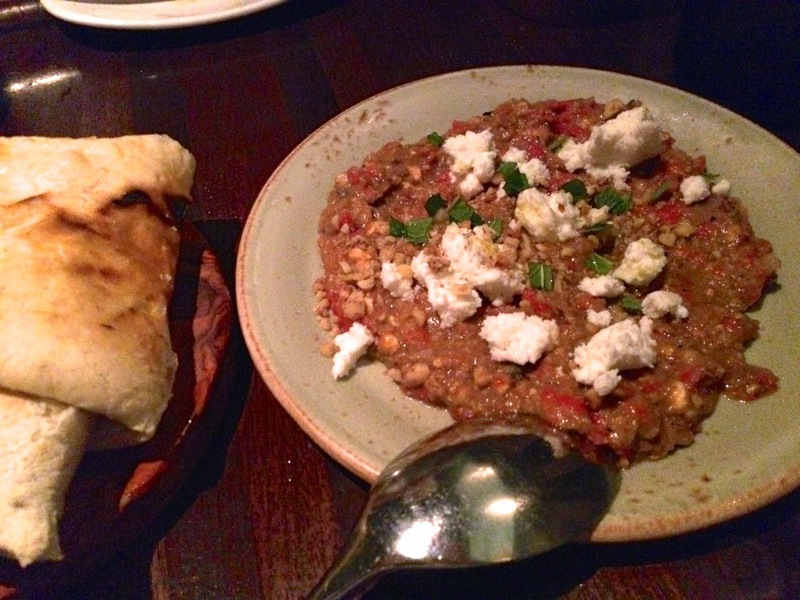 Like a lot of restaurants serving a menu of mostly small plates, the food arrives fast-and-furious, and Kapnos did a good job of pairing what we ordered into courses of sorts. It's definitely a busy place, but despite that, I felt our server did a good job of making sure our needs were seen to. The second half of our dinner kicked off with Greek fries, made with ground chickpeas instead of potatoes. 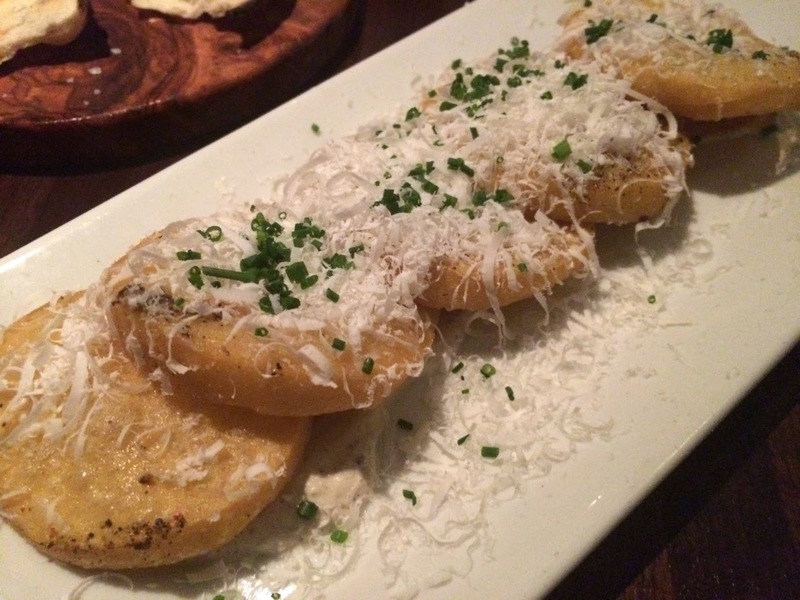 The soft fried discs arrive with a sprinkle of mizithra cheese. A plate of loukaniko sausage served with oranges, white bean puree and shaved radishes disappeared so fast I can't quite recall what the sausage was like, but we must have liked it! I do, however, fondly remember my favorite dish of the evening. 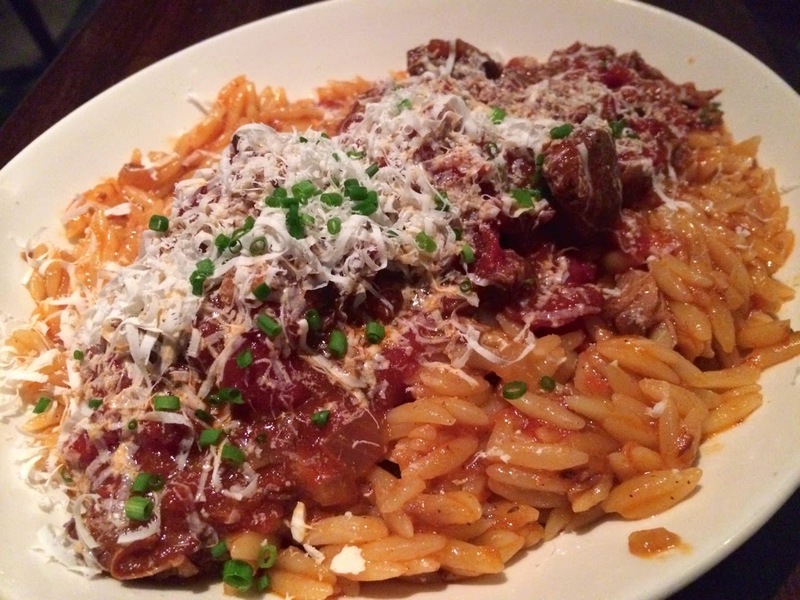 Kapama is the Saturday special: a hearty, homey pasta dish of orzo with spicy tomato sauce upon which rests tender braised lamb shank. Chris remarked that the spices in the dish tasted like Christmas, and I can't disagree that its blend, which included clove, puts you in the mood for the holidays, even in the late summer. Lots of peppercorn--in an assortment of colors--showed up in our dinner: our fries were dusted with ground black peppercorn, our almond and apricot baklava's accompanying ice cream was made with pink peppercorn and, in a cool twist, our beet salad came with green peppercorn meringues, wafery, delicate pieces that melted in your mouth. As I'm a major fan of all things peppercorn, I welcome this kitchen's interest in it. The Kapnos interior is dark, but by no means cavernous. I really like the fresh design by D.C.-area firm Streetsense, a subdued mix of olive walls, warm wood floors and elegant light fixtures. We were seated close to a large window that looks into the kitchen, which provided me lots of entertainment during the evening. Kapnos interior (photo by Greg Powers). Kapnos is the third restaurant in Mike Isabella's burgeoning D.C. restaurant collective, and the most welcome since his original, Graffiato, charmed the city (me included) when it opened 3 years ago. 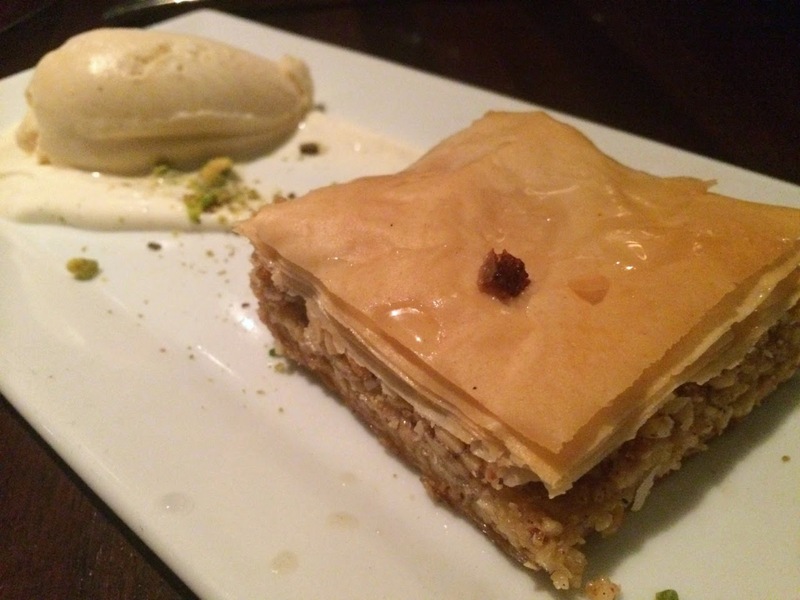 In addition to drawing from similar influences as Isabella's former haunt Zaytinya, Kapnos' executive chef, George Pagonis, is an alum of Graffiato, as well as Zaytinya where he worked under Isabella. Pagonis is definitely somebody worth knowing: he'll be competing in this fall's season of Top Chef (the season is already taped, so don't worry about the chef being absent from the kitchen). It's worth noting that Kapnos is attached to G by Mike Isabella, a sandwich shop by day and tasting-menu restaurant by night. 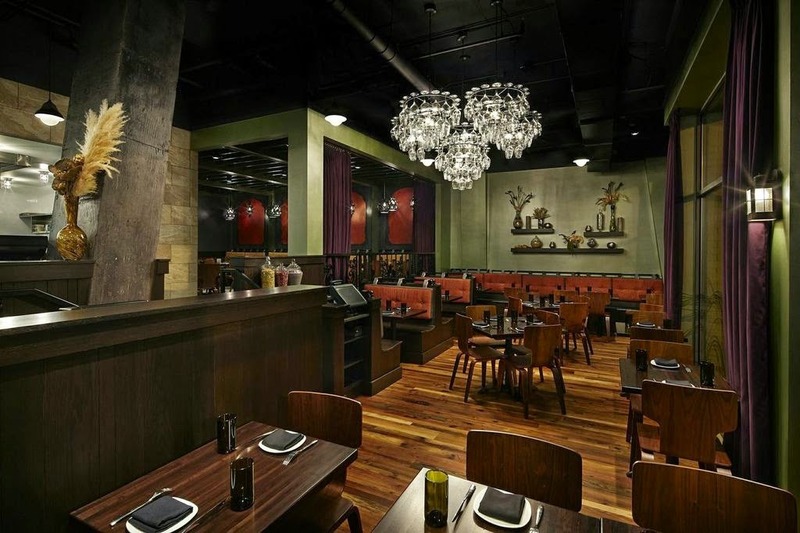 A sister restaurant, Kapnos Taverna, is due to open this fall in Northern Virginia. Isabella is clearly a guy with a lot of ambition. Thankfully, it's accompanied by continued great execution. Kapnos, 2201 14th Street NW (at W Street NW), Washington, D.C. (U Street Corridor/Shaw). (202) 234-5000. Reservations: Open Table. My father is going for his bus tours dc he is a big fan of Greek cuisine like you. After reading your lovely blog post I bookmark it to show it to my father for recommendation to taste the yummy food of this hotel. After reading your blog he will go there to try these delicious dishes especially the ginger beer a bitters. Wonderful! I hope he enjoys it. It's not in a hotel, although there are probably hotels nearby.